Fourth-quarter GDP rose 2.2 percent, in line with expectations. In all, 2018 closed with a 2.9 percent increase, short of President Donald Trump's hopes for 3 percent growth. Consumer and government spending, as well as nonresidential fixed investment, were revised down and subtracted from the reading. Economic growth in the U.S. slowed in the final part of 2018, with GDP posting a gain of just 2.2 percent in the fourth quarter, the Commerce Department reported Thursday. The final reading was in line with expectations of economists surveyed by Dow Jones. That was down from the previous estimate of 2.6 percent and leaves full-year growth at 2.9 percent. Third-quarter growth registered 3.4 percent. In all, 2018 was the best year for the economy since 2015 and well above the 2.2 percent increase in 2017. The economy grew 3 percent when compared with the fourth quarter of 2017. 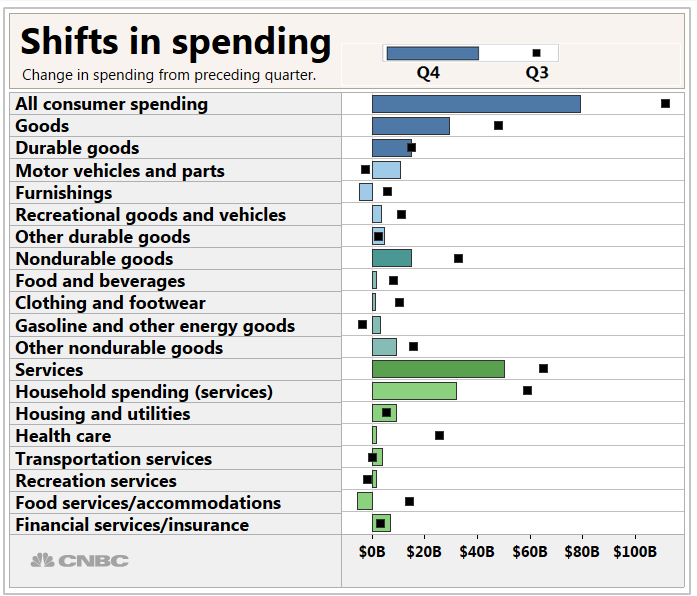 Consumer spending as well as government expenditures at the state and national levels and nonresidential fixed investment all were revised down and subtracted from the GDP. Imports also were revised lower amid continuing tensions between the U.S. and its global trading partners. However, exports also rose, helping fuel the GDP rise. Overall, the fourth quarter increase tied for the slowest gain since the first quarter of 2018. Nonresidential fixed investment, a key sign of business activity, rose 5.4 percent, up from 2.5 percent in the third quarter. Equipment spending increased 6.6 percent but investment in structures fell 3.9 percent, its second consecutive decline. Residential investment also fell, down 4.7 percent for its fourth straight negative quarter. Exports increased by 1.8 percent while imports were up 2 percent. In addition to the waning GDP growth, corporate profits edged lower in the fourth quarter but finished the year up 7.8 percent, compared with 3.2 percent in 2017. Companies benefited from the White House-backed tax cut that slashed the corporate rate to 21 percent. The quarter wraps up a year of solid growth that was nonetheless a bit slower than what President Donald Trump was hoping to see. In the first full year for the administration's massive tax cut approved in 2017, GDP growth fell short of the 3 percent goal that the president had promised. A late-year slowdown in consumer spending as well as weaker business investment and uncertainty over trade were just a few of the issues helping cloud the economic horizon. This year has started off with more uncertainty. Economists largely expect growth to slow, and some are even looking for the first signs of recession. First-quarter GDP growth is likely to be below 2 percent, though earlier forecasts of a possible flat or negative reading appear unfounded now. The Atlanta Fed, for instance, had been tracking a gain of just 0.2 percent a few weeks ago but has since raised its outlook to 1.5 percent. CNBC's Rapid Update tracker of leading economists also sees a 1.5 percent growth rate for the quarter. Recent indicators also have been pointing up. The trade deficit fell sharply in January, and some of the regional manufacturing readings have come in better than expected. However, real estate and retail remain wild cards, and businesses are closely watching the U.S.-China trade talks, which resumed Thursday in Beijing.